Our local farmers market is moving into high season. The market is just a couple of paths in a high school parking lot lined with a couple of dozen or so stalls. It is modest compared with the vibrant green market in New York City’s Union Square or the wondrous carnival at the Ferry Building in San Francisco; it pales next to the huge market in nearby Torrance. But visiting the various stalls and merchants has become a Sunday ritual for our family. By this time of season, green peas are gone, and asparagus is just hanging on as the weather gets warmer. Sweet cherries have given their last gasp. Plump ears of corn are on limited display. Tomatoes have made a tentative appearance; it’s still too early for the big, juicy specimens of late summer. Right now, the stars of the market are berries of all sorts and stone fruit of every variety. This last week, the family met at the market in search of ingredients for our Sunday meal – all, that is, except the recent high school graduate who has taken to sleeping late and enjoying the days of summer before she heads off to college. The plan was for her mother to find some fruit for a fruit sauce so that on our return the graduate would arise and prepare pancakes for all of the exhausted shoppers. That plan served a secondary purpose: a crash course in basic cooking skills before the fledging leaves the nest. Everything worked as planned, and we enjoyed a delicious late breakfast. In fact, I liked them so much that I made my own batch a few days later and topped the pancakes with maple syrup that Peter and René had brought to us a gift from their recent trip to Montreal. In a small bowl, whisk together the flour, sugar, baking powder, baking soda, and salt. Separate the eggs and set aside the whites. 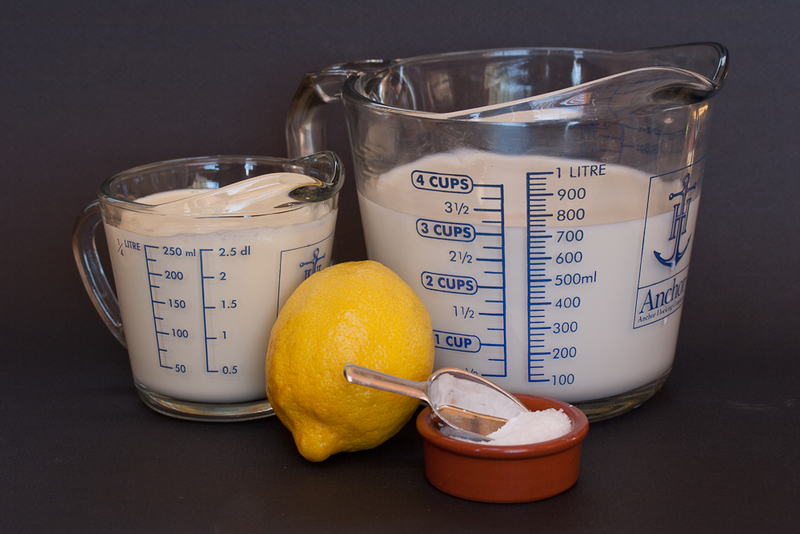 In a larger bowl, beat together the egg yolks, ricotta, buttermilk, butter, lemon juice, and zest. Whip the reserved egg whites to form stiff peaks. Then by thirds, gently fold them into the batter mixture. Let the batter rest for about 15 minutes while you heat a griddle over medium heat. 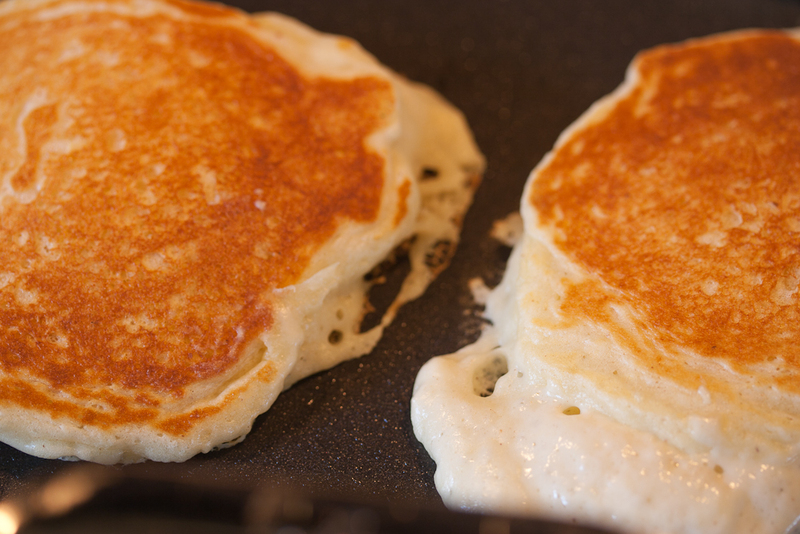 Pour ½ cup of batter onto the griddle for individual pancakes. Do not crowd, and work in batches. Turn the pancakes when bubbles have formed on the surface and the edges are golden brown. When both sides are browned to your liking, serve immediately or transfer to a warm oven until all the pancakes have been prepared. In a small sauce pan combine the water, sugar, lemon juice and cornstarch, stirring to make sure the sugar is dissolved and the corn starch is completely dispersed. Place the pan over medium-low heat and, stirring frequently, bring the mixture to a gentle boil. Reduce the heat to simmer. Add the fruit and cook until the mixture has thickened and the fruit has begun to release its juices, about 5 to 10 minutes. 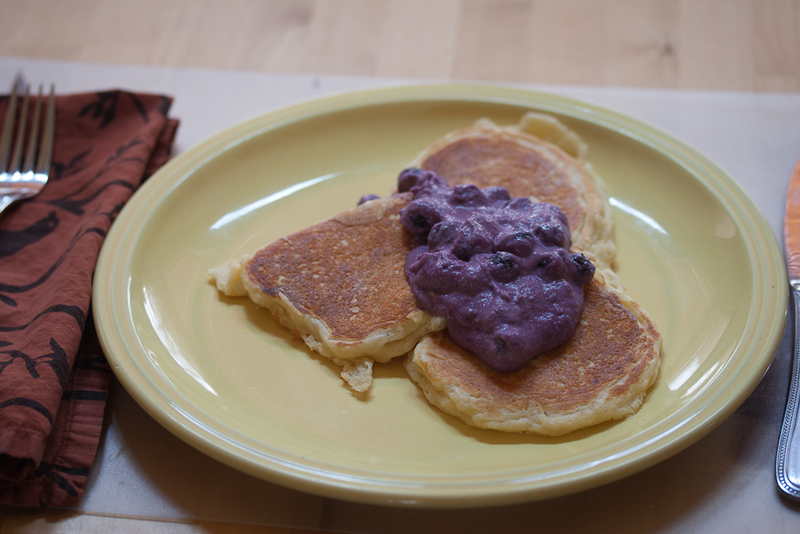 Remove from the heat and serve over the ricotta pancakes. The State of North Dakota has only one official food. That’s the official fruit: choke cherry, used for jams jellies, and of course home-made wine. Many believe that cheese buttons should be the official food. As far as I have been able to learn, they are absolutely unique to the state. My step-grandmother made them often as a celebratory dish when I was growing up. I loved them, but I have never eaten them since she stopped making them many years ago. She came from a large German family who farmed on the prairies of eastern North Dakota. No doubt they were part of the immigrant wave of German farmers who came to the Dakotas at the end of the nineteenth century. The immigrants actually came from Russia where they had originally moved with the urging of Catherine the Great. There they were successful wheat farmers, so successful in fact that the native Russians grew increasingly hostile and drove them out. Apparently, North Dakota has many similarities with that part of Russia, so it was only natural that the immigrant Germans again became successful wheat farmers. My step-grandmother cooked meals for an itinerant threshing crew headed by my grandfather. He had two little boys in tow after their mother had died in the Great Influenza Epidemic of 1918. Both my grandfather and my step-grandmother thought the little boys needed a mother, and so they married. The little boys and their offspring grew up eating a lot of German food including sauerkraut and cheese buttons. There are many variant spellings of the local name of the dish. Perhaps the most common is kase knoepla, but the literal German translation is Käse knõpfen, so I’ll go with that. Cheese buttons have some amazing similarities with Italian ricotta ravioli. The recipe for the noodle dough is exactly the same as a common recipe for pasta, and the recipe for the farm cheese is similar to at least one version of ricotta. You will note that the dish is remarkably deficient of any green vegetable. Instead it is heavy on bread and flour from the wheat as well as eggs, milk, and butter from the barn yard. That should serve as a warning that this is not a dish for you if you are worried about your cholesterol. But if you like butter, it is hard to think of a better dish. It goes without saying that you cannot substitute margarine or oil. Pour the milk into a large, heavy bottomed pot and heat slowly over a medium-low flame, stirring occasionally to avoid scorching on the bottom. 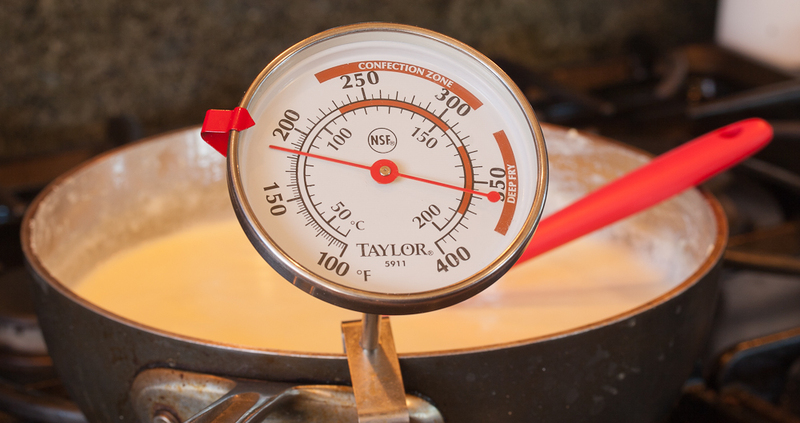 When the milk has reached 150°F, stir in the vinegar, remove from the heat, and cover. Stir occasionally as the mixture cools, and the curds form, about 45 minutes. Line a large colander with fine-mesh cheesecloth or a clean kitchen towel. Pour the curds and whey into the towel and allow them to drain. 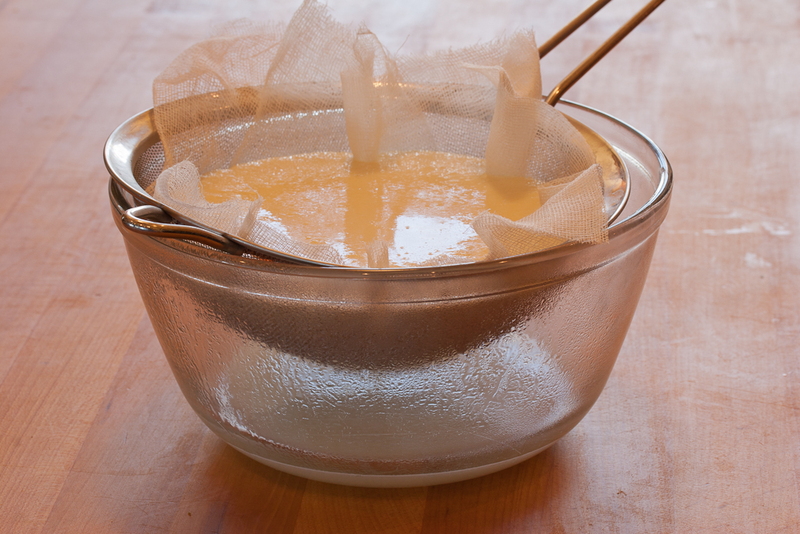 The curds should form a ball in the bottom of the cheesecloth. Twist the cloth gently between your hands and over the sink to squeeze out any remaining whey. Transfer the cheese to a bowl and combine with the eggs and salt. Add pepper to taste and set aside. Break the three eggs into the well, and using a table fork, beat the eggs gently. Stir in 3 tablespoons of water and then begin to draw the flour in from the edge of the well, stirring and mixing as you go. Continue to draw in the flour, adding 1 more tablespoon of water. 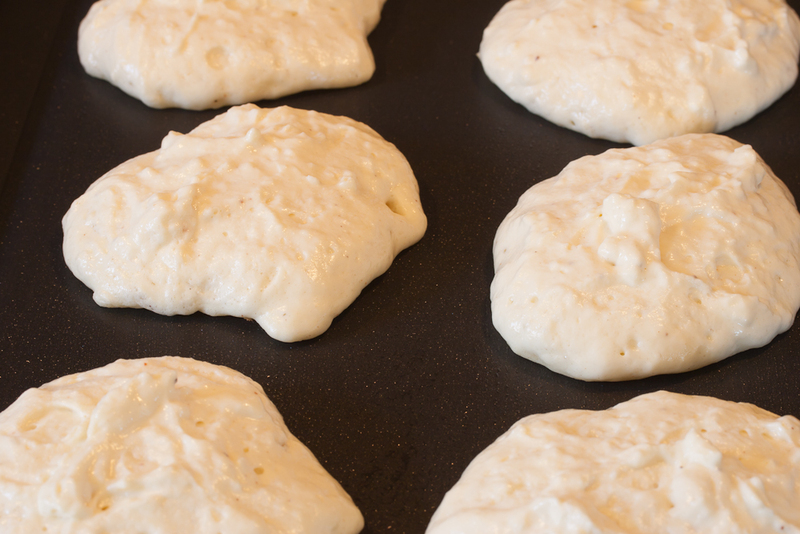 Avoid adding too much water, or the dough will get sticky. When the flour is completely incorporated, form the dough into a ball and knead for a 5 to 10 minutes until it is glistening and forms a smooth ball. Cover loosely with a kitchen towel and let rest for 20 minutes. When you are ready to roll out the dough, flour the work surface lightly. Divide the dough into 4 equal pieces. Roll out one piece with a rolling pin, covering the remaining pieces in plastic while you work. Roll each piece into a round about 16 inches in diameter. Dust the dough lightly with flour if it is too sticky. Cut the dough into 2 inch squares. Place a scant teaspoon of the cheese mixture in the center of each square. Moisten the edges of the squares with water and fold over into triangles and/or rectangles (Your choice!). Gently squeeze the edges between your fingers until they are well sealed. Bring a large pot of salted water to the boil. In batches, add the cheese buttons to the boiling water. They will sink to the bottom but eventually float. Let the buttons continue to cook for a few minutes after they have floated. Transfer to a bowl with a slotted spoon and keep warm in the oven until all of the buttons have been cooked. Cut any extra noodle dough into thin strips, boil for 4 -5 minutes, drain, and add to the buttons. Stir in the bread cubes and sauté until the bread cubes are lightly browned and crisp. Pour over the boiled cheese buttons and noodles, stirring gently to mix. Sicily is such a beautiful place with deep blue seas and fleecy clouds The surf pounds against the beaches, and the mainland of Italy is just across the Straits. The island traces its history back to Greek times when Syracuse was one of the great city states. Since then it has had a tumultuous history as its own country as well as under the dominance of many other countries and empires including the Greeks, Romans, Byzantines, Turks, Arabs, and Italy. That rich history has produced amazing archeology, architecture, food, and customs. The beautiful sunlight has produced a sunny population that seems to take everything in stride. In the USA, many think of Sicily as the home of the Godfather. That stereotype annoys the locals. At the same time, they often feel obliged to mention it – mostly so they can dispel the myth. Messina is the port city at the straits, and it is filled with beautiful old buildings and famous churches. Undoubtedly, one could spend days exploring, but the highlight of our trip was a drive along the coast and up a narrow winding road to the town of Taormina. The port is beautiful. with the Stele of the Madonna greeting and saying farewell to vessels as well as wishing a blessing for the city and for all sailors. The mainland of Italy is just across the Strait of Messala which is 1.9 miles across at its closest point and 3.2 miles from Messala to the mainland. Plans to build the world’s longest sing-span suspension bridge are well along. Taormina has been a tourist destination since Grecian times. The town looks down on the coastline far below, and in the distance, clouds play around the summit of Mount Etna. The air is clear and sunny, and the town streets are lined with interesting shops, ancient palaces, and vendors of all kinds. One of the required visits is the Greek amphitheater on a hill overlooking the town. The walk is steep but not very long. It is well worth it. The ruin is very well-preserved, and the views from its upper heights are spectacular. It is impossible to visit without thinking of the countless people who have been here before you. After the visit, the walk back down the hill leaves most tourists either hungry, thirsty, or both. There are plenty of vendors in little stalls to accommodate, and the choices seem limitless, ranging from soft drinks to pasta. Among the most popular items for sale are the cannoli. There are different sizes and different flavors, and they make great treats to enjoy on the stroll back to the center of the town. The recipe that follows is my take on the pistachio cannoli that we bought on our stroll down the hillside. To make your own, you will need some special aluminum cannoli molds for shaping the shells. Molds should be easily available at a well-stocked kitchen store. A 4 inch cutter is also handy. You may find a nest of cutters of different sizes another useful purchase. In a medium bowl, combine the flour, cinnamon, sugar, and cocoa. Wrap the ball of dough with plastic wrap and refrigerate for 30 minutes or more. Divide the dough in half, and roll out each half on a lightly floured surface to about 1/16th inch thick and large enough to cut out 4 4 inch circles using a cookie cutter or a cardboard circle as a template. Using a rolling-pin, roll each circle into an oval. Wrap each oval around a cannolo mold, long side parallel to the mold. Seal the seam with a dab of the egg white. Fry each cannolo shell in a heavy pan containing about 2 inches of canola oil and pre-heated to 375°F, turning until the shell is well browned and crisp. Transfer to a pad of paper towels to let cool enough until you can easily remove the mold without burning your fingers. Continue to fry the shaped shells until they are all fried. Set in a dry place ready for filling. In a medium bowl, combine all of the ingredients, mixing well. Serve immediately so the cannoli don’t get soggy. Our ovens recently went on the blink, and we had to do without baking for over two weeks while the repairman ordered parts. We made it through the crisis – with some withdrawal symptoms – and our ovens were finally restored to working order. To celebrate, I decided to make a couple of quiches using some shrimp and fresh Spring asparagus from the grocery store. I made the quiches only to discover that I had left out the asparagus. My fall-back plan was to use the asparagus the next night in something else. The plan wound up to be an exercise in cleaning out the refrigerator. 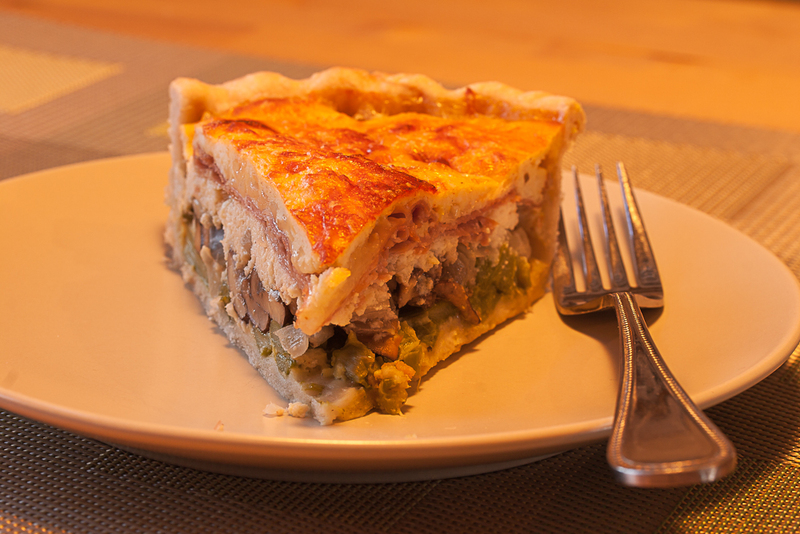 I came up with what is not really a quiche, so I called it a ricotta pie. Regardless of the name, it turned out to be a good use for the asparagus. Make a well in the center of the mixture and pour in the water, mixing with a table fork until the mixture comes together in a ball. In a large bowl, combine the ricotta, eggs, Pernod, salt, and pepper until smooth and well blended. Set aside. Wash the asparagus, trim the woody ends (saving them for stock), and cut into 1-inch pieces. Set aside. Clean and slice the mushrooms. Sauté them in olive oil until they have given up their liquid. Drain and set aside. Remove the chilled pie crust dough from the refrigerator and roll it into a circle large enough to line a 9 inch pie pan with enough to crimp the top edge. Ladle half of the ricotta mixture into the bottom of the prepared pie shell. Arrange the asparagus pieces over the filling. Then add the mushrooms, Swiss cheese, and prosciutto in layers. Cover with the remaining ricotta mixture and sprinkle with the grated Parmesan cheese. Bake in the middle of an oven pre-heated to 425° for 10 minutes. Then lower the oven temperature to 350° for an additional 60 minutes. Turn the baking pie front to back in the oven about half way through the baking. 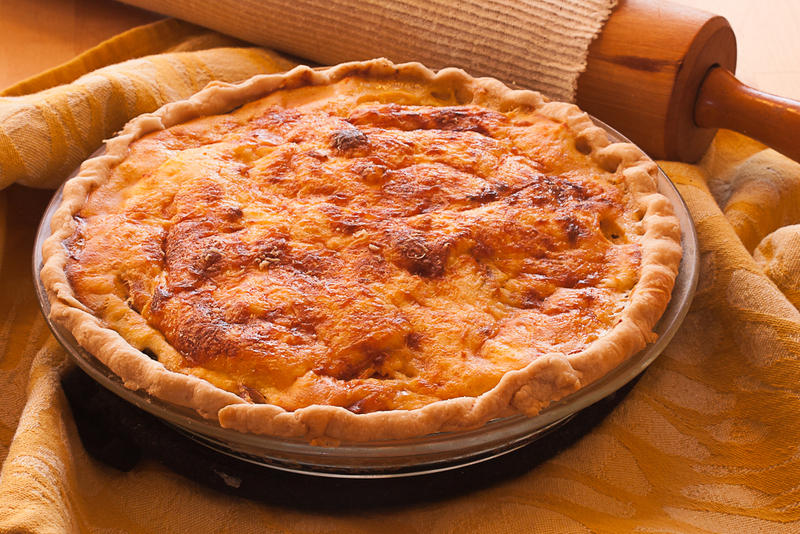 Watch carefully toward the end of baking and remove from the oven if the pie becomes too brown. Place the finished pie on a cooling rack for 5 minutes. Then slice into 6 or 8 pieces. Serve while still warm.